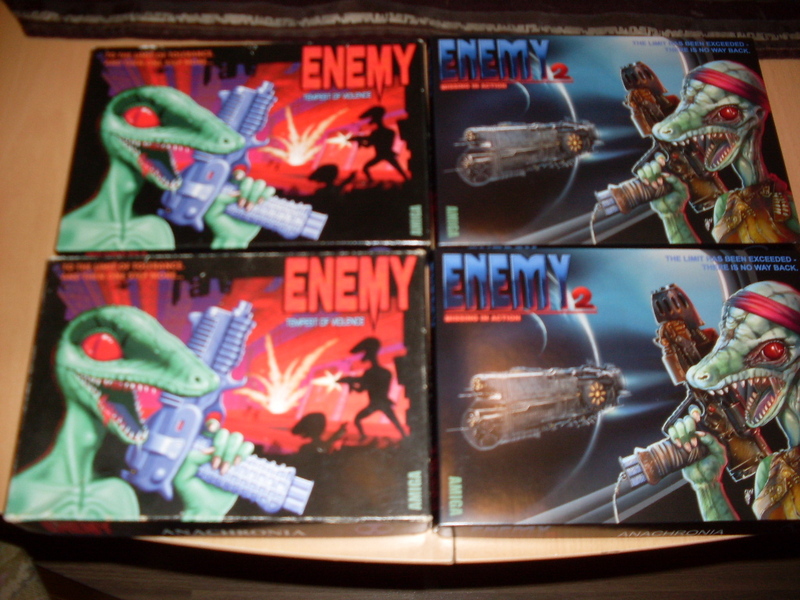 ENEMY 2 Collectors Edition out now! The Collectors Edition of ENEMY 2: Missing in Action is finished and available now! Both the manual and the game are in German and in English. When the game is started for the first time the desired language is installed (note: the floppy disks will be modified). ENEMY 2 requires 1 MB of RAM. If necessary the CPU caches and the AGA chipset must be deactivated. WinUAE users will find a compatible configuration file on our website. ENEMY is an action adventure in the style of the game Flashback. The first part ENEMY: Tempest of Violence was released in 1997 exclusively for Amiga. Unfortunately at the time the Amiga market was already dead, so that only relatively few copies were sold. André Wüthrich, the man behind the project, drew the conclusion and rejected the plans for a second part. Some years later I contacted him and tried to motivate him for a sequel. At first without success. When I then designed new levels and confronted him with this, things took their course: André took a long thought exchange and we began to continue the story. Unfortunately the source code of the first part no longer existed and a new programming was excluded. We decided to make a continuation on the basis of the prequel. Getting out the maximum with given means. Together we reconstructed the level editor and draw new graphics. Because of the very low hardware requirements, there was a lot of headaches: the graphics should not be too big and had to share their color palette with the game figure, the shadow effects as well as the panel. Additional colors had to be patched in the main file of the game. A bit easier was the level design. We had extensive possibilities in the creation of new playing cards. In conjunction with the new graphics and the ability to define the abilities and intelligence of each character, new puzzles have been created for the player. Thus, even those who have mastered the first part will receive enough new brainteasers in ENEMY 2. Due to the complexity and the length of the game as well as the technical limitations, the development lasted over four years. In 2013 the game was finished. We translated it into English and published it as a free download version. We offer the Collectors Edition for a donation of 15.00 EUR + shipping costs. Shipping costs 1.70 EUR (Germany) and 4.10 EUR (worldwide). If you take two copies you have to pay for shipping only once! The telescope box is sent unfolded to avoid transport damage and to keep the shipping costs low. Instructions for folding the box are available on our homepage. Please use the order form on our homepage because I am not able to look here around regulary. Thank you. Last edited by crack; 18 December 2016 at 19:53.
a) the updated Enemy: Tempest of Violence v1.04_Easy-Play. b) Enemy 2 - Missing in Action v1.28. Thanks for the fast shipping. The box and the content looks really good. You have TWO boxes of the first part??!! It took me a year to find one! I have bought the first part right after the release date. In the nineties there were no problem while finding and buying amiga games. and the article is DONE! Coverart was done by Ogan Kandemiroglu not Celal Kandemiroglu. Even though I didn't write it, it's been fixed. Yes Cover Art was done by Ogan Kandemiroglu. And the box of the prequel is nowadays really rare. Is Enemy 1 still available to buy? Any chance of a new run from the original authors? Yes, same here. The game received wider distribution outside German-speaking countries after Alive Mediasoft secured the rights in the UK to the game ~2 years after initial release. That's when I bought my copy IIRC. Now the game would be much harder to find I imagine, even on Ebay, as it wouldn't have sold huge numbers given it was late-ish 1990s release. Anyway, great to see retro games still being released by devs in good old-fashioned boxes in 2016! I'm very sorry, but no, no chance. I was planning to sell mine, but it wouldn't be cheap!